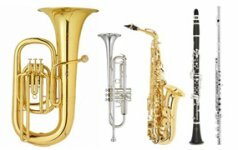 Rent-To-Own your band instrument interest free! Rentals start as low as $22.70 a month, which includes repair and maintenance. If your instrument ever needs repair, we will give you a loaner free of charge. We buy preowned instruments and keep a selection of used and refurbished instruments for sale. Once you have your instrument, we have everything you need to keep it playing like new. Come back to us for reeds, mouthpieces, cleaning kits, oil, and grease.